« where is the “mission field”? 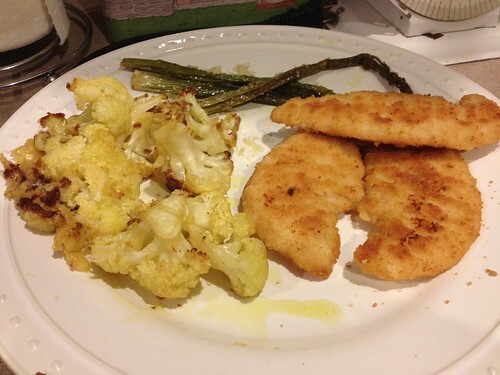 roasted garlic-parmesan cauliflower – my new favorite veggie. seriously, i have made this about 3 times now and i cant get enough! its such a quick and easy side dish to go with anything(like my GF tenders up there). i love roasted vegetables in general and then adding fragrant garlic and melty parmesan cheese. oh my word. the best parts of this dish are the little crispy bits of cheese and crumbs that stick to the pan. eggplant parmesan made with almond flour – i loved this. it had a bunch of steps, but it came together really fast. i wasnt sure what to expect using almond flour instead of wheat, but it was delicious and crispy. i made the portion a little smaller and ate it for dinner by myself and then lunch the next day. sweet potato hash with greens– yum! i am a huge fan of greens so this was right up my alley. i swapped sweet potatoes for white, and roasted them earlier in the day, instead of steaming them. the only thing i would do different next time is cook the onions and then place them to the side while cooking the potatoes.or maybe not chop them so small. or something. by the time i got the potatoes fried the onions had burnt to a crisp. i ate this alone as a veggie meal, but it would be so good along with eggs! i also made a really great chicken and mexican rice dish from the “organic transformation diet” cookbook. i will post the recipe on another post, since its not online. this month i will remember to take more photos of the food before i devour it! 🙂 but there are photos on all the websites. I pinned that cauliflower. Excited to try it! Oooh, that cauliflower dish looks good. I can eat a whole head of cauliflower too using this curry & peas dish that I make. Delicious. I’m glad you made the Eggplant Parmesan. This is my favorite recipe for this dish, I like it even better than the ones served at restaurants.